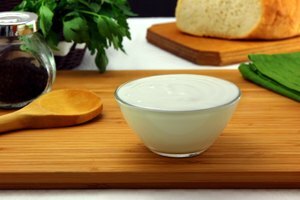 You don't have to look far to find a viable substitute for cheesecloth in an average kitchen. Even the most-common items, such as paper towels and coffee filters, capably strain soups, sauces and other liquids. But they aren't good at performing cheesecloth's intended use: straining whey from cheese curds. You can use substitute straining materials to remove broken pieces of cork or sediment from wine. Coffee filters, paper towels and linen dishcloths make viable cheesecloth substitutes in a pinch. 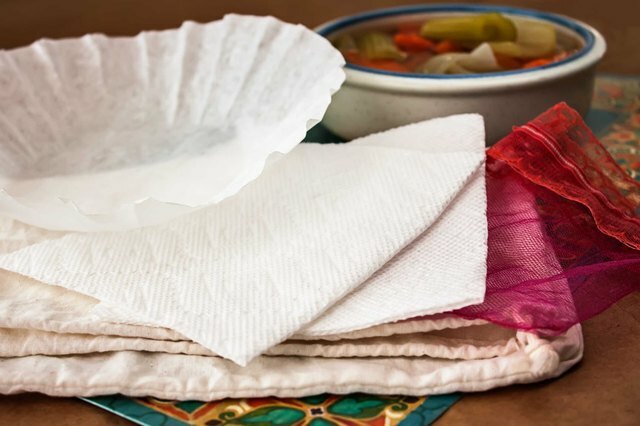 Coffee filters and paper towels work best for straining soups and sauces; however, paper towels absorb liquid during straining until they saturate, so you lose a little volume of soup or sauce in the straining process. 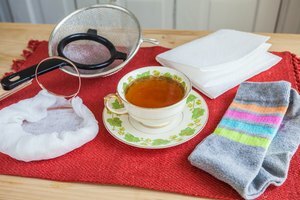 To strain soup or sauce using a paper towel, coffee filter or linen cloth, first set a mesh strainer over the straining vessel or the container that you plan to strain the liquid into. With a slotted spoon, remove as many solids, such as chopped vegetables, from the soup as you can. 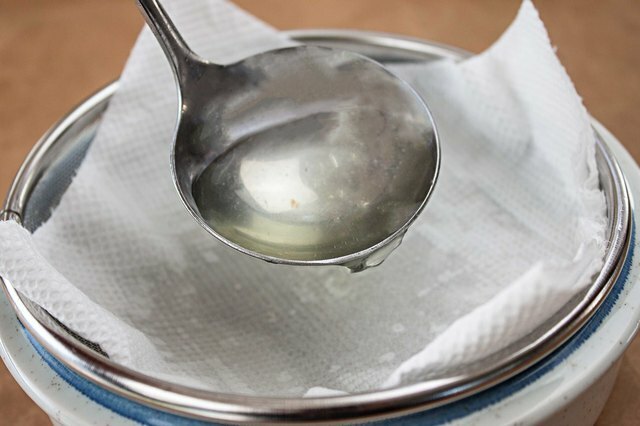 Ladle the soup or sauce into the strainer until it reaches about 1/2 inch from the top of the filter, paper towel or cloth; if you add too much too fast, the liquid will overcome the straining material and pour from the sides of the strainer. Continue ladling the liquid into the strainer; if you see it draining too slowly, stir the liquid in the strainer. If you're using a paper towel or coffee filter, exchange it for a fresh one when it appears to stop straining altogether. Flour-sack cloths and fine-mesh bags double as cheesecloth, but they aren't typically found in the average home kitchen -- unless you're an almond-milk aficionado or have a supply of 19th-century flour sacks in your cupboard. Flour-sack cloths, made of the same material used to hold flour before the advent of kraft paper, have a tighter weave than cheesecloth. 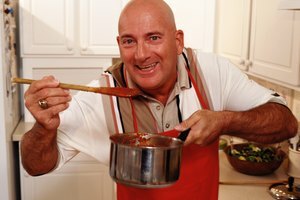 They typically strain liquids much more slowly, but, as a result, you get a smoother, clearer soup or sauce. Several online purveyors, specialty markets and some supermarkets carry flour-sack cloths. Line the cloth over a mesh strainer and strain the soup or sauce through the cloth as you would a cheesecloth. Fine-mesh bags are commonly used to strain nut milks and for holding grains when using Brew-In-A-Bag, or BIAB, home beer-brewing kits. To strain in a fine-mesh bag, set up the mesh strainer and straining vessel. Place the bag in the strainer and, after removing as many solids as you can from the liquid with a slotted spoon, ladle the liquid into it. Continue ladling liquid into the bag until it strains through. Straining cloths do everything cheesecloth does, but they consist of stronger cotton thread. They typically come in sizes ranging from 10-by-10 inches to 18-by-20 inches. Use straining cloths as you would cheesecloth. There are a couple of other uses for alternative straining materials. 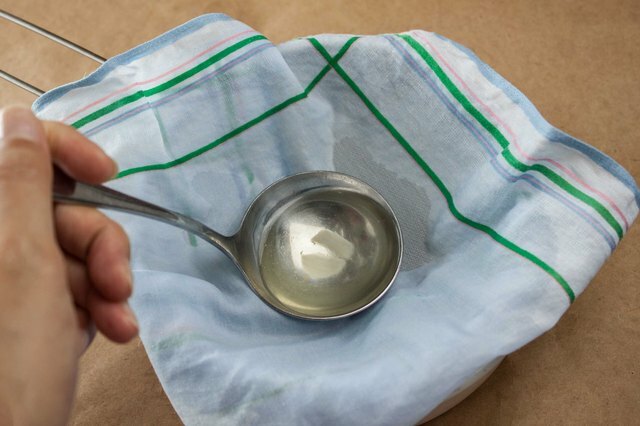 After straining stocks, broths or consommes, you commonly find a thin sheen of fat collected on the surface; this is normal and occurs even when you use cheesecloth as the straining material. 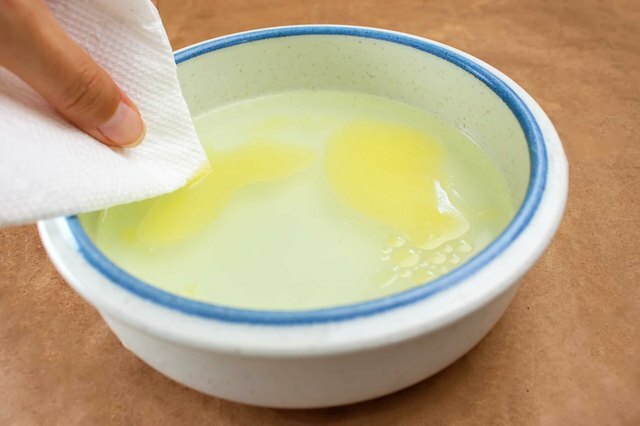 To remove this layer of fat, let the liquid cool to warm after straining it to allow time for the fat to float to the surface. Next, fold a coffee filter or paper towel in fourths and gently skim it over the surface. The filter or towel will collect the surface fat and result in a near-crystalline stock or broth.